For the compilation album, see Curriculum Vitae (album). For the 1975 film, see Curriculum Vitae (film). A curriculum vitae (English: /kəˈrɪkjʊləm ˈviːtaɪ, -ˈwiːtaɪ, -ˈvaɪtiː/), often shortened as CV or vita, is a written overview of a person's experience and other qualifications for a job opportunity. It is akin to a résumé in North America. In some countries, a CV is typically the first item that a potential employer encounters regarding the job seeker and is typically used to screen applicants, often followed by an interview. CVs may also be requested for applicants to postsecondary programs, scholarships, grants and bursaries. In the 2010s, some applicants provide an electronic text of their CV to employers using email, an online employment website or using a job-oriented social-networking-service website, such as LinkedIn. In the United Kingdom, most Commonwealth countries, and Ireland, a CV is short (usually a maximum of two sides of A4 paper), and therefore contains only a summary of the job seeker's employment history, qualifications, education, and some personal information. Some parts of Asia require applicants' photos, date of birth, and most recent salary information. CVs are often tailored to change the emphasis of the information according to the particular position for which the job seeker is applying. A CV can also be extended to include an extra page for the jobseeker's publications if these are important for the job. 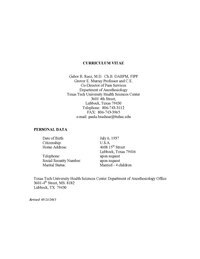 In the United States, Pakistan, Canada, Australia, Germany, India, Cuba and Russia a CV is a comprehensive document used in academic circles and medical careers that elaborate on education, publications, and other achievements. A CV contains greater detail than a résumé, a shorter summary which is more often used in applications for jobs, but it is often expected that professionals use a short CV that highlights the current focus of their academic lives and not necessarily their full history. A CV is generally used when applying for a position in academia, while a resume is generally used when applying for a position in industry, non-profit, and the public sector. Curriculum vitae is a Latin expression which can be loosely translated as [the] course of [my] life. In current usage, curriculum is less marked as a foreign loanword. Traditionally the word vitae is rendered in English using the ligature æ, hence vitæ, although this convention (curriculum vitæ) is less common in contemporary practice. The plural of curriculum vitae, in Latin, is formed following Latin rules of grammar as curricula vitae, and is used along with curricula vitarum, each of which is debated as being more grammatically correct than the other. In English, the plural of the full expression curriculum vitae is seldom used; the plural of curriculum on its own is usually written as "curricula", rather than the traditional curriculums. a presentation by headings: it will highlight the candidate's experiences without revealing the chronology of the career. The most common topics: personal presentation, course and training, professional experiences and finally your interests. Do not hesitate to add a references section if you have good recommendations relevant to the position. a presentation by skill: it will showcase your achievements during your career more than the title of your posts. ^ "Curriculum Vitae | Definition of Curriculum Vitae by Merriam-Webster". merriam-webster.com. Retrieved 27 June 2016. ^ "American Heritage Dictionary Entry: curriculum vitae". ahdictionary.com. Retrieved 27 June 2016. ^ "Resume vs. Curriculum Vitae: What's the Difference? | Internship and Career Center". icc.ucdavis.edu. Retrieved 27 June 2016. ^ "alt.usage.english FAQ". Archived from the original on 3 April 2012. Retrieved 2 June 2012. ^ "Write a Short and Quality Resume". Retrieved 14 Apr 2019. Look up curriculum vitae in Wiktionary, the free dictionary. Wikimedia Commons has media related to Curricula Vitae. An interview is a conversation where questions are asked and answers are given. In common parlance, the word "interview" refers to a one-on-one conversation between an interviewer and an interviewee. The interviewer asks questions to which the interviewee responds, usually so information may be transferred from interviewee to interviewer. Sometimes, information can be transferred in both directions. It is a communication, unlike a speech, which produces a one-way flow of information. A job fair, also referred commonly as a career fair or career expo, is an event in which employers, recruiters, and schools give information to potential employees. Job seekers attend these while trying to make a good impression to potential coworkers by speaking face-to-face with one another, filling out résumés, and asking questions in attempt to get a good feel on the work needed. Likewise, online job fairs are held, giving job seekers another way to get in contact with probable employers using the internet. An application for employment is a standard business document which is prepared with questions deemed relevant by an [employer] in order for the employer to determine the best [candidate] I to be given the responsibility of fulfilling the work needs of the company. Most companies provide such forms to anyone upon request at which point it becomes the responsibility of the applicant to complete the document form and returning it to the employer at will for consideration. The completed and returned document notifies the company of the applicants availability and desire to be employed and their [wikt:qualification|qualifications] and background so a determination can be made as to which candidate should be hired.